William RING (1565 – After 1620 Before 1629) was Alex’s 11th Great Grandfather; one of 4,096 in this generation in the Shaw line. William Ring was born about 1565 in Pettistree, Suffolk, England. His parents are not known. He married Mary DURRANT 21 May 1601 in Ufford, Suffolk, England. William had been aboard the Speedwell, sister ship to the Mayflower, intending to voyage across the Atlantic in 1620. William was, however, among the passengers who could not fit aboard the Mayflower when the Speedwell was deemed unseaworthy. He returned to Leiden and died there sometime between 1620 and 1629. Mary Durrant was born about 1584 in Ufford, Suffolk, England. Her parents were Thomas DURRANT and Mary [__?__]. Mary was a member of the Leiden Separatist community. She arrived in Plymouth in 1629 or 1630 most probably on the second Mayflower, which sailed from Gravesend in March, and landed at Salem MA. on 15 May 1629, bringing 35 passengers, several of whom were from the Pilgrim colony which had been living for a number of years in the Netherlands. Mary Ring seems to have some education : she signed her will herself and her inventory contains books. She also seems to have been a woman of business, with money owed to her by William Bradford and Edward Winslow. Mary died 15 Jul 1631 om Plymouth, Plymouth Colony. Mary Ring wrote a will, and an inventory of her estate was taken at her death. William was a weaver and member of the Separatist community in Leiden Holland, and a devoted follower of the Pilgrim’s pastor, Mr. John Robinson. The family is known to be present in Leyden by 1614. These Separatists had found the English church, once Catholic, now Anglican, to be irredeemable and sought to remove themselves from the world, rather than fight and die as martyres. Crossing to permissive Holland after 1605, the group spent their first year in the roaring port of sinful Amsterdam (where abject poverty juxtaposed with wealth “confronted them like an armed man”). Fearing for their communal continuity, they then retreated into the academic quiet of nearby Leyden. The distance was not enough, and so the colony arranged to transplant itself to the new world in 1620. 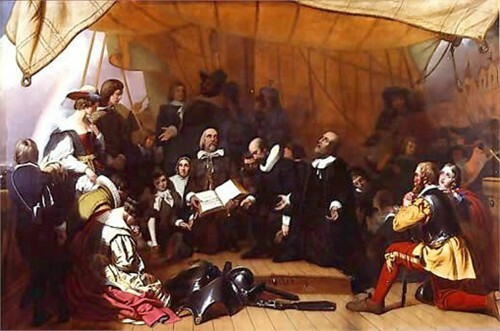 William was guaranteed by William Bradford and Alex Price on June 7, 1619. (Guaranteed mean’t vouched for and sworn in.) When the “Speedwell” sailed from Delfthaven on July 22, 1620, William was aboard. At Dartmouth, on August 17th, after leaks forced the ship into port, one of the separatist leaders, agent Robert Cushman wrote that “Poor William Ring and myself do strive who shall be meat first for the fishes, but we look for a glorious resurection.” When the “Mayflower” set out alone on September 6th, neither William nor Mary were aboard. Elizabeth’s first husband Stephen Dean was born 1606 in Southwark, England. Stephen died 6 Oct 1634 in Plymouth, Mass. Elizabeth and Stephen’s daughter Miriam was born at Plymouth about 1634. On 31 Jan 1692/93 she became the second wife our ancestor John WING II (1611-1699). She is interred at Dillingham Cemetery. Miriam’s will dated 24 May 1701 proved 8 Jan 1702/03 gives all her property to Dean Smith, “son of my Kinswoman, Bethiah Smith of Monomoy.” Bethiah was Miriam’s niece, daughter of her sister Susannah Dean and Stephen Snow. Elizabeth’s second husband Josiah Cooke was born 1610 in England. Some say his parents were our ancestors Francis COOKE and Hester le MAHIEU but serious genealogists don’t believe in this connection. Josiah died 17 Oct 1673 in Eastham, Barnstable, Mass. However there are old books, some made newly available on CD and online which make the claim that Josias is a son of Francis. One such is Signers of the Mayflower Compact by Annie Arnoux Haxtun, which was first published in 1897-1899 and was reprinted by Genealogical Publishing Company. “The argument now [that Josias is not the son of Francis] is founded not upon what was said, but what was not. Some say certainty is self-evident and requires no assertion, but I’m including because the question comes up quite often. ii. Merriam Deane b: 1633 in Dorchester, Massachusetts Bay. Miriam is the oldest first time bride in our family tree. She was 59 when she married our ancestor John WING as his second wife. She is interred at Dillingham Cemetery. Miriam’s will dated 24 May 1701 proved 8 Jan 1702/03 gives all her property to Dean Smith, “son of my Kinswoman, Bethiah Smith of Monomoy.” Bethiah was Miriam’s niece, daughter of her sister Susannah Dean and Stephen Snow. v. Anna Cooke b: 1636 in Plymouth, Plymouth Colony; d. 25 Jul 1656 in Eastham, Plymouth Colony; m. 18 Jan 1654 in Eastham, Plymouth Colony to Mark Snow (b. 9 May 1628 in Plymouth, Plymouth Colony – d. 9 Jan 1695 in Eastham, Barnstable, Mass.) Mark’s brother Stephen married Anna’s half sister Susannah. Their parents were our ancestors Nicholas SNOW and Constance HOPKINS. Anna had one daughter Anne Snow who was born 7 Jul 1656 in Eastham three weeks before her death. After Anna died, Mark married 9 Jan 1660 in Eastham to Jane Prence (daughter of Gov. Thomas PRENCE) and had eight more children between 1661 and 1679.
vii. Josiah Cooke b: 1645 in Nauset (Eastham), Plymouth Colony; d. d. 31 Jan 1732 Eastham ); m. 27 Jul 1668 in Eastham to Deborah Hopkins (b: Jun 1648 in Eastham, Plymouth Colony; d. Bef Dec 1727 Eastham) Deborah’s parents were Gyles Hopkins and Katherine Wheldon. All four of her grandparents were our ancestors. Gabriel WHELDON & Jane [__?__] and Stephen HOPKINS and Mary [__?__]. Josiah and Deborah had eight children born between 1669 and 1686..
Andrew’s first wife Deborah Hopkins was born 1625 in Plymouth, Plymouth, Mass. Her father was our ancestor Stephen HOPKINS. Deborah died 1674 in Plymouth, Plymouth, Mass. There were two woman named Lettice [joy in Latin] in early Plymouth. Lettice Hanford and Lettice Kempton are often mixed up with four marriages between them. There is only one recorded death: 22 Feb 1691. Here’s my crack at unsorting the tangle. Andrew’s second wife Lettice Kempton was about 1629 in London. Her parents were our ancestors Ephraim KEMPTON and Hannah [__?__]. Lettice first married 1648 in Plymouth, Plymouth, Mass to John Morton, son of George MORTON (b. 1616 in Leyden, Holland – d. 3 Oct 1673 in Plymouth, Mass.). Lettice died 22 Feb 1691 in Middleboro, Plymouth, Mass. Lettice Hanford first married 8 Apr 1635 in Scituate, Plymouth, Mass. to Edward Foster (b. 24 Jan 1590 in Frittendon, Kent, England – d. 25 Nov 1643 in Scituate, Plymouth, Mass.) at Mr. Cudworth’s [Scituate] by Captain Standish. She was admitted to Scituate church (as “Goody Foster”) 25 December 1636. They had 3 children: Timothy, Timothy again, & Elizabeth Hewett Ray. After Edward died, she married Edward Jenkins (1618 Kent, England – d. 1699 Scituate, Plymouth, Mass) On 4 March 1634/5, “Edw[ar]d Jeakins,” one of seven servants of Nathaniel Tilden of Tenterden, Kent, was included in the list of passengers of the Hercules of Sandwich. Lettice and Edward had 3-4 children: Samuel (b. 1645), (probably) Sarah Bacon, Mary Atkinson Cocke, & Thomas. In the late 1660s and early 1670s Edward Jenkins had to come to the aid of two of his children who experienced a number of problems. On 5 Mar 1666/67, “Dinah Silvester, Sarah Smith, and the daughter of Edward Jenkens, [are] summoned to the next court. This entry was posted in 13th Generation, Dissenter, First Comer, Immigrant - England, Line - Shaw, Pioneer, Storied and tagged Immigrant Widow, Mayflower, Meat first for the fishes, Plymouth, The Speedwell - 1620. Bookmark the permalink. In the second paragraph, Stephen Ring and Deborah Hopkins are listed as William’s parents. Stephan was actually his son, who married Deborah Hopkins. Thanks for the catch. I have updated the post.